SEOUL, Oct. 16 (Yonhap) — K-pop boy band BTOB on Monday made a comeback with its first full-length album in two years, promising to become a successful, long-running act at a time when one idol group after another come quickly and vanish easily. “As we’ve gone through four years as obscure artists, we’re not going to be obsessed with chart races. We’re just thankful for having the opportunity to present our music,” BTOB member Minhyuk said during a press conference for the group’s new album “Brother Act.” at Imperial Palace Hotel in southern Seoul. 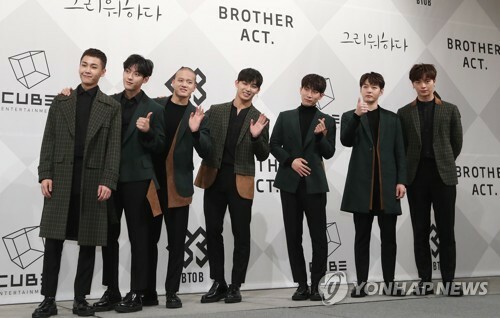 “Brother Act.” is BTOB’s first full-length album since “Complete” released in June of 2015. Like many fall releases, it emphasizes the team’s more mature aspect through the lead track “Missing You,” a ballad written by member Hyunsik. BTOB, now in its sixth year, is the latest to join the fray of K-pop’s fall male idol comebacks. BTS has dominated the K-pop chart race with its recent release “Love Yourself: Her,” while monster rookie band Wanna One is also gearing up for a November comeback. Highlight, formerly known as BEAST, is also dropping a new album later in the day. “We’re also amazed when watching fellow artists such as Wanna One or BTS mesmerize the world. We believe we will also have the opportunity to show a fresh image that we weren’t able to share in the past,” Minhyuk said. BTOB members also said they welcomed Highlight’s return on the same day. Highlight is formed by former BEAST members, who used to be under Cube Entertainment together with BTOB. “We’re honored since we had much respect for them since our trainee days. It is only a joyful thing for various artists to present a wide range of music,” Minhyuk added. 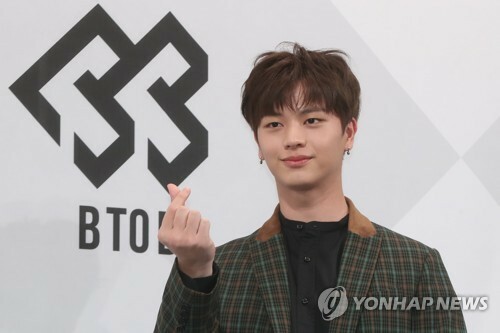 Member Sungjae, who appeared in tvN’s mega hit drama “Guardian: The Lonely and Great God,” promised to become a long-running boy band, comparing BTOB to a long-lasting battery. “We never imagine the end,” Sungjae said.